Renell Label Print will supply you with durable custom permanent labels for your particular application. 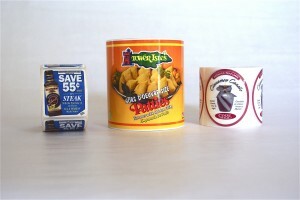 There are over 40 variations of permanent labels and adhesives available. We can simplify the process by suggesting the right material and adhesive that will keep your label permanently affixed to the surface. We will even supply you with test materials and samples so you can see first hand how the label will perform in your specific application. We have in-depth knowledge and experience in working with tamper evident labels and “hard-to-label” surfaces. These include raw wood, recycled corrugated cartons, wall surfaces and more. Custom permanent labels can also be made for challenging environments, including those with varying temperatures and moisture. Many substrate materials are available with permanent adhesives, from Foil and Metallic labels to Mylar labels to just plain paper labels. This allows us to offer a wide variety of material combinations to suit your needs. Need Help with Your Custom Permanent Label Application?